Beautiful and medicinal, turkey tail mushrooms are a great wild mushroom species to become familiar with. This colorful, banded mushroom is called turkey tail for its resemblance to the semi-circular, banded tails of wild turkeys and goes by the Latin name of Trametes versicolor or Coriolus versicolor or the even older name of Polyporus versicolor. This mushroom is common in many parts of North America, and grows in shelf-like layers on rotting wood. They are recognized by their thin, boldly banded, fan-shaped and flexible caps, white pore surface underneath and slightly fuzzy cap surface. It is known as a "saprobic" or "saprophytic" fungus, which means it feeds on decaying wood. In this way it plays a vital role in transforming dead wood into material usable by other organisms, and eventually helps in turning that wood into mulch and then soil. They grow on deciduous and occasionally coniferous trees. 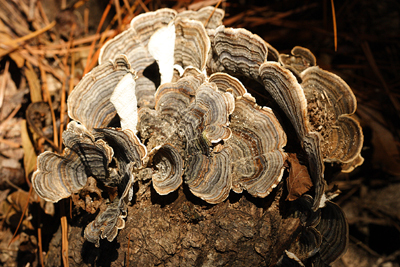 Turkey tails are one of the most intensively studied medicinal mushrooms in the world. Recently, this mushroom has earned a lot of attention for its anti-tumor properties. This mushroom has a long history of use in Traditional Chinese medicine. In 2012, the FDA approved the use of it in clinical trials to be used in combination with conventional chemotherapy treatments for several types of cancer. Turkey tail mushrooms have shown to be effective in some cases as part of the treatment against the following cancers: breast cancer, cervical cancer, gastric cancer, Leukemia, liver cancer, lung cancer and prostate cancer. These mushrooms also have other medicinal properties including antibacterial, antioxidant, antiviral, immune enhancer, kidney tonic, and liver tonic. Turkey tail mushrooms are used medicinally most often in the form of a tincture or strong tea. Tinctures are extractions made by infusing the cut pieces of these mushrooms in a strong 40-50% alcohol. For more details on making tinctures, check out our article: How to make a tincture. Turkey tail tea is made by slowly boiling this mushroom, using the hot water to help break down the mushrooms structure. This structure, called chitin, is very tough and difficult for us to digest. Often the boiling process is done for up to 90 minutes or sometimes more. This concentrated tea is then drunk as a immune-boosting tonic. Some herbalists use both of these methods, and combine them into one tonic. The alcohol extraction and the hot water extraction methods draw out different properties from the mushrooms. Though the turkey tails themselves are not generally considered a food, they can be added into slow cooked meals such as stews. This allows them to infuse into stew and pass on some of the healthy benefits as part of a meal. Then the mushroom pieces themselves can be removed and composted. Please seek the advice of a doctor before using any kind of plant or fungi medicinally. Turkey tail mushrooms are not typically known to cause complications or counteract other medication, but it is still essential to discuss what is right for you with your doctor. Everybody's body is different, so approach any new kinds of plants or fungi with caution. Check out this interesting article about Turkey Tail Mushrooms on the Huffington Post, written by Paul Stamets, the founder of Fungi Perfecti. 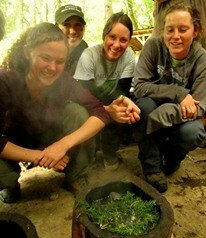 Learn more at Alderleaf's Wild Edible & Medicinal Plants Courses. Disclaimer: This article is for educational purposes only. It is not intended as a substitute for the advice provided by your physician or other medical professional. If you have or suspect that you have a serious health problem, promptly contact your health care provider. Always consult with a health care practitioner before using any herbal remedy, especially if pregnant, nursing, or have a medical condition. Alderleaf Wilderness College, their owners and employees, shall not be liable for injury, damage, or loss allegedly arising from the information contained in the articles found on this website.